Playing a Puzzle can give the one this pure selfish pleasure that he can ever have, the best quality time with self thinking, focusing and acting, a comfort zone for reflection and meditation: a zone where the world stop existing, where you can spend hours and hours with yourself with no feeling of loneliness nor boredom. There are many ways to live a puzzle, and I say “live” because I always thought and I still do, that there are many lessons that you can learn from Puzzle, and they can be applied in real life. I can go even further saying that Puzzling has its own philosophy, that you can always recall whenever you are stuck in life. Lesson 1: when you go to buy a puzzle, you always choose the one which is more difficult than the previous one that you just have finished. It will take longer to assemble, and the pure pleasure to challenge yourself and to push further your boundaries is way far multiplied. Lesson2: it has nothing to do with the final picture, because you know already what it’s gona be, it’s all about the process of making, proceeding and finally reaching your target. The journey not the destination! Lesson3: you can spend hours and days assembling many parts of your puzzle which are totally unrelated: part of a face, part of a sky, a tree or a castle stairs, but most probably it takes just one piece added to make you link all parts together and suddenly it all makes sense. Lesson4, you always start by the easiest part of the scene, a sky, a tree, and further it become harder and harder, you can sometimes hit the bottom of despair and decide that you can’t make it anymore, you will never be able to finish it. But with some time, patience and self-consolation, you finish it proudly. And nothing can equal that moment of victory: a feeling of conquering your own fears and negative feelings. After all you only challenge yourself while playing puzzle. Lesson5: God is a creator and created us on his image, it’s easy to imagine what the final image will be, but nothing can predict you the rush of pleasure of adding the last piece and contemplating, proudly, the work of art of your own hands. Lesson6: whenever you are stuck and can’t find this small little piece that you’ve been searching for a whole hour, you can just leave it for a while. 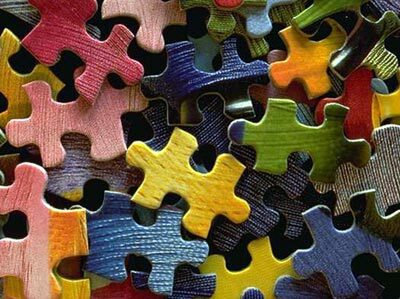 Once you resume the making of your puzzle, it will be the first piece that your eyes tumble on. The most surprising thing is to find out that it has always been there but your eyes kept overlooking it. Lesson7: it’s cynical but true: you never find the piece that you search for, NOW at the moment. NEVER! What you should do is to leave it to the time, and take it as good as it gets, by the end you will find it anyways. Lesson8: while adding the last piece, you get these mixed feelings: from one side, your are proud that you have accomplished your target, from the other side, you feel this emptiness inside you and you start asking yourself: what’s next? And here you are, in quest for a new challenge/target/puzzle to live. Lesson9: you can always deconstruct your puzzle and repeat it, but it will never be the same or equal the same pleasure that you had assembling it the first time. Best solution is: put it aside and get another one, more difficult and start over and over again. Holding my long dress tail in my hands, holding my head high, and putting my earphones wishing her song will never stop vibrating in my head. Humming, enchanted, and in trance this was my mood when I left Emel Mathlouthi concert, which took place at El Genaina Theater Thursday 3rd of September, in Ramadan program featuring young independent women singers form the Arab world) . Way far from being monotone, her voice varies all the time, strong and wild expressing the best the freedom that she sings. Freedom, peace, love, this is all about her. Petite in her summer red dress, Emel came on stage barefoot. Spontaneous performer, she gave her audience that she enjoys singing and enteracting with the music even more than being on stage. Unconditional freedom she sings. And accordingly she choose a very well prepared program, she sung all her Arabic and traditional Tunisian songs (none of her world songs repertoire), and she was keen to please the Egyptian audience by choosing three songs from Cheikh Imam repertoire. Not the well-known songs for Imam which will provoke a guaranteed long applause from the audience but she choose carefully which match perfectly the general theme of her songs and her concert: Resistance, and call for Freedom. Therefore the concert was entertaining and inspiring. This is only happen when an artist has a rich culture and a distinctive position. 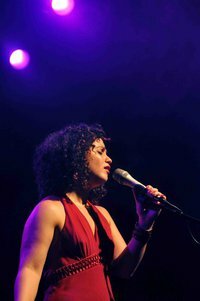 Way far to compare Emel Mathlouthy concert to her peer Jordanian/Iraqi singer Macadi Nahas, who performed on the same stage one week earlier. Originally singing traditional songs from Iraq, Macadi already produced two Albums “Kan yama Kan” and “Khilkhal”. Although she spent over 70% from her concert singing Fayrouse Songs, and ended up with “sahar el Layali” song, obviously trying to gain the acceptance and the applause of the Egyptian audience, and play it safe! The result was a concert with no spirit nor identity. And when I say “move”, I mean the basic primary meaning of the verb. A woman has the right to move her hands while talking, sit with slightly parted legs, or take a crossed legs posture , lean her head, bend her back, lay down to walk barefoot anywhere without being down-looked, underestimated nor judged . A woman has the right to express herself verbally and physically as freely as she can. It may sound trivial to proclaim such a right in a society where women still have limited access to education, health and shelters, where they suffer from domestic violence, and many other pressures and prejudgments. But believe me it’s all related to what image/role that society associates to the woman and expects her to fulfill. As a child I have been always scolded for laying down raising my leg and putting them out of the window! I suppose this wasn’t respectful (I kind of agree, as I did it basically because, I was always amused to imagine the face of the viewer if s/he just saw a pair of barefoot from the window in his/her face) but the reason that I have been told was that all my legs are uncovered. A bit younger, I always got this severe look because I sit with parted legs, this is not what a respectful well-raised young woman do. Raised in a religious school, I was always keen to have a friend for company to hold my hands behind my back, to avoid moving them while talking to my nun, which was considered a sign of disrespect! If we analyze all these proper postures code promoted, circulated and forced to be followed by the society, we will figure out that a proper respectful “Lady” is who “stay still”. Now how liberating it could be, to be in a company (especially if there are guys around) where nobody judges you according to the posture you take while talking or downgrades your maturity or femininity if for example you laid down on your belly , or took off your shoes and walk barefoot on sand or on grass, or if suddenly you decided to lay down on your back, raise your legs perpendicularly, or spread them wild. Or when you ride in a car and get this urge to get your face and half of your body out of the window’s car to face the cool breeze.